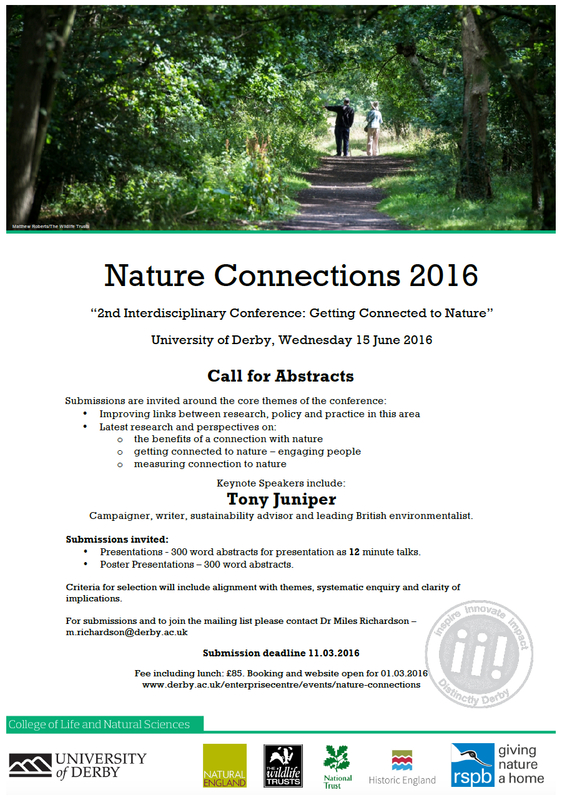 The first Nature Connections conference last year was a great success and Nature Connections 2016, a second Interdisciplinary Conference on Getting Connected to Nature, will take place at the University of Derby, Wednesday 15 June 2016. Several partners, led by the University of Derby and Natural England will be supporting NC2016, bringing together key players from the research, policy and provider communities. The day will provide a forum for sharing and learning from the latest research and practice in nature connection. This will enable us to develop a common understanding of the role of nature connection in well-being and pro-environmental behaviour. We also plan to identify and agree priority actions that would help address key challenges for policy, practice and research. The latest developments in nature connection will be presented on the day, including presentation of draft models for change and the launch of the results of the pilot for a new national scale for nature connection. Keynote speakers planned include Tony Juniper, campaigner, writer, sustainability advisor and leading British environmentalist, but there are plans to add others. Including award-winning poet and arts advocate Jo Bell, the former Canal Laureate for the UK. 300 word abstracts for presentation as 12 minute talks or posters should be sent to me – m.richardson@derby.ac.uk – you can also use that address to be added to the mailing list. Criteria for selection will include alignment with themes, systematic enquiry and clarity of implications. Deadline for submission 11th March 2016. A conference web site will be available and open for bookings (£85 including lunch) before 1st March 2016.